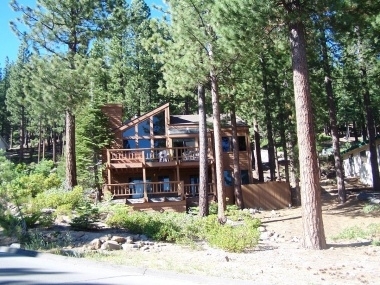 Perfect vacation getaway for the whole family in this beautiful mountain retreat in quaint Incline Village, NV. This lovely home sleeps 14 with beautiful lake views from the living room, kitchen, dining room and two decks. Relax in the hot tub located on the upstairs deck after an excellent day of skiing at Diamond Peak Ski Resort, located just minutes away. One master bedroom upstairs and one master bedroom downstairs, in addition to a room with two full size bunk beds and a twin bed that has a door to the downstairs deck. Upstairs is a loft with 3 twin beds and if you need more room there is a queen size sofa sleeper. Nice open floor plan with open beam high ceilings, kitchen looks over the dining room that seats 8 and has an attached wet-bar.